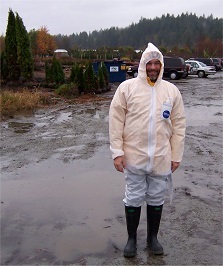 Mr. Stephan Brière is the Head Plant Quarantine Plant Pathologist at the Ottawa Laboratory of the Canadian Food Inspection Agency (CFIA). He has over 25 years of training and experience in the plant protection field working as a mycologist and plant pathologist. His diverse knowledge covers biology, epidemiology and disease diagnosis of fungi, bacteria and viruses. Mr. Brière has worked in a variety of organizational categories ranging from plant disease diagnostics, plant pathogen containment, research, biocontrol, teaching, industry and government. His work contributes greatly to Canada's National Plant Protection programs setting a standard to prevent the introduction and spread of invasive species to Canada's agriculture and forestry industry. In his current role he works directly in support of Canada's national plant protection programs, standards, policies, regulations and initiatives to prevent the introduction and spread of invasive plant pathogens that threaten Canada's crops and forests. Responsible for Phytophthora ramorum import and survey diagnostics for Canada since 2002. Mr. Brière is assembling the collections of isolates that are essential in DNA re-sequencing of lineages from multiple fungal strains from Canada and across the world. He is a key player incompiling the broad based detection of the 50 priority pathogens and works with the UBC group to develop the pathogen diagnostic tool.